The development of optical storage technology has advanced rapidly in recent years. Thanks to the latest Blu-ray technology, currently 100 GB can be written on a 51/4 true WORM Blu-ray Disc. 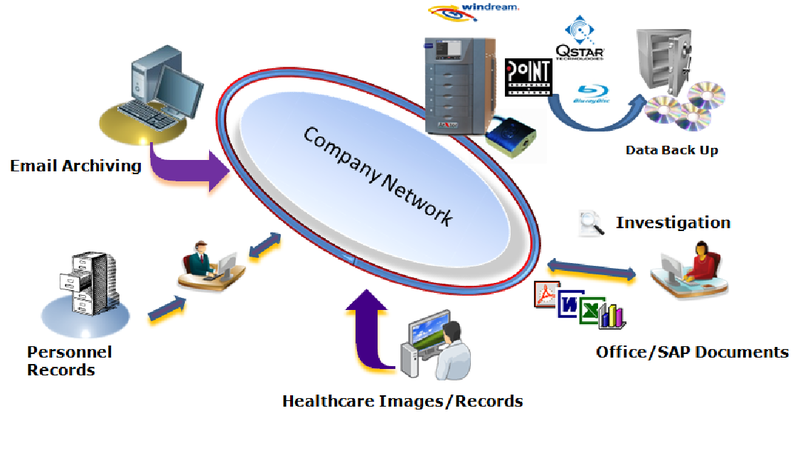 The combined DISC scanfabrik solution offers a complete solution for electronic record management and archiving of e-mails, documents and related SAP/Office documents. The DISC scanfabrik solution provides a complete archive storage solution with an integrated Windream server to ensure compliant storage of all electronic, business-relevant data. It facilitates different “object types” (e.g personnel records, invoices, contracts, delivery notes, e-mails) and automated life cycle control and management of all your digital content. Optional: Windream Software Extensions for BPM, workflow specific applications , SAP Interface,E-mail Archiving etc.